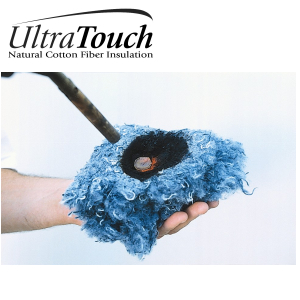 UltraTouch insulation is designed to provide powerful noise reduction, as well as energy efficiency. 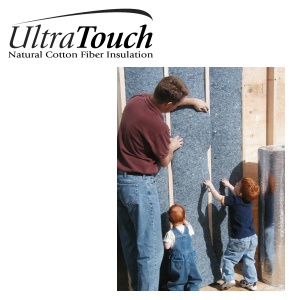 UltraTouch is a recycled insulation made from cotton denim and is a LEED-Certified Class-A building material. This fire-resistant insulation contains no harsh chemicals or fibers and installs quickly and with ease. Our UltraTouch soundproof insulation is perfect for installing walls, ceilings, attics, as well as wrapping noisy pipes. Since this is cotton insulation, there’s no worrying about irritating the skin or exposure to young children. Using UltraTouch insulation is the best way to safely insulate your home or office while producing the smallest possible carbon footprint. Our soundproof insulation is designed to not only deliver fire protection and noise reduction, but also prevent the accumulation of molds and bacteria in the event of exposure to the elements. SoundAway is proud to be an authorized UltraTouch denim insulation distributor with the knowledge to help you find exactly what you need. UltraTouch ships from local warehouses in Southern and Northern California, Colorado, Connecticut, Massachusetts, New Jersey, and New York. Buy our UltraTouch insulation for the ultimate in LEED-Certified soundproofing.